Dave Streich photo. On May 23, 2001, Camera Obscura was added to the National Register of Historic Places. Once part of Whitney's Playland, Camera Obscura is an optic marvel that allows a 360-degree image of the oceanfront to be projected onto a large viewing surface inside. 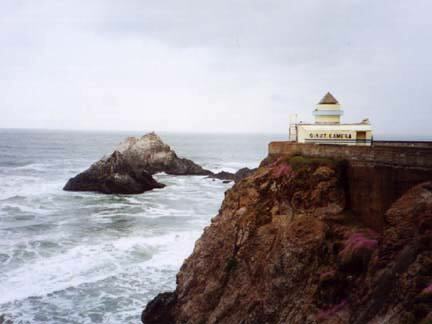 Recently threatened by planned remodeling of the Cliff House, its neighbor near Seal Rocks and Ocean Beach, the City's Giant Camera is now officially recognized as the country's oldest freestanding Camera Obscura in its original location. The educational and entertaining attraction so delighted a San Francisco filmmaker that she changed her name in honor of it. Yes, San Francisco is home to both Camera Obscura and Ms. Camera Obscura!